Bring 6 or more students and save! Watch King Lear, Hamlet (available now), Macbeth and Romeo and Juliet (coming soon) in your classroom using our HD production presented alongside Shakespeare’s text. PerformancePlus includes an online study toolkit with discussion questions, lesson plans and interviews with cast and creative team members. Support for PerformancePlus is generously provided by The John and Myrna Daniels Charitable Foundation. Looking for Study Guides from our past seasons? Send us an email. If you require an accessible version of one or more of the PDF documents listed here (ie. Braille, large print, screen-reader compatible, etc), please send us an email request specifying which document(s) you need, and in which format. For any other requests please contact the Education Department via email. William Shakespeare was born in the small town of Stratford-upon-Avon, Warwickshire, England, in 1564. The exact date of his birth is unknown, but today it is celebrated on April 23, which is the date of his death and, based on the record of his baptism, may very well also have been his birthday. Shakespeare's father was John Shakespeare, a glover, and his mother was Mary Arden, the daughter of a wealthy farmer. Shakespeare probably attended what is now the Edward VI Grammar School. At age 18 he married a farmer's daughter, Anne Hathaway, with whom he had three children: Susanna, born in 1583, and, two years later, the twins Hamnet (who died in childhood) and Judith. Nothing more is known of his life until 1592, when his earliest known play, the first part of Henry VI, became a hit in London, where Shakespeare had gone (without his family) to work as an actor. Soon afterwards, an outbreak of the plague forced theatres to close temporarily, and Shakespeare turned for a while to writing poetry. By 1594 he was back in the theatre, acting with the Lord Chamberlain's Men. He quickly established himself as one of London's most successful dramatists, with an income that enabled him, in 1597, to buy a mansion back in Stratford. In 1599 he became a shareholder in London's newly built Globe Theatre. In 1603, Shakespeare's company was awarded a royal patent, becoming known as the King's Men. Possibly as early as 1610, the playwright retired to his home in Stratford-upon-Avon, living there and continuing to invest in real estate until his death on April 23, 1616. He is buried in the town's Holy Trinity Church. In the first collected edition of his works in 1623, fellow playwright Ben Jonson called him a man "not of an age, but for all time." Not only did Shakespeare write some of the most popular plays of all time, but he was a very prolific writer, writing at least thirty-eight works in twenty-three years. Shakespeare enjoyed great popularity in his lifetime, and 450 years later, he is still the most produced playwright in the world. The Festival Theatre's Tanya stage, 1953. When the railway industry pulled out of Stratford in the early 1950s, journalist Tom Patterson had an idea for breathing new life into his native city’s economy: a festival of Shakespearean theatre. His vision won the support of Stratford City Council and an enthusiastic committee of citizens, and also of the legendary British actor and director Tyrone Guthrie, who agreed to become the festival’s first Artistic Director. In the fall of 1952, work began in earnest to launch the Stratford Festival the following summer. A giant canvas tent was ordered from Chicago, and in the parklands by the Avon River, work began on a concrete amphitheatre at the centre of which would be a revolutionary thrust stage, created by renowned theatrical designer Tanya Moiseiwitsch. From the balcony of the thrust stage, on July 13, 1953, actor Alec Guinness spoke the opening lines of Richard III. Those words marked the beginning of an astonishing new chapter in Canadian theatre history. Left: Designer Tanya Moiseiwitsch and Assistant Director Cecil Clark with an original set model. | Right: Lowering the tent over the original stage. Photos by Peter Smith. Artistic Director Antoni Cimolino celebrates the Festival Theatre's thrust stage, designed by Tanya Moiseiwitsch for Stratford's first season in 1953, and restored to its original configuration for 2013. 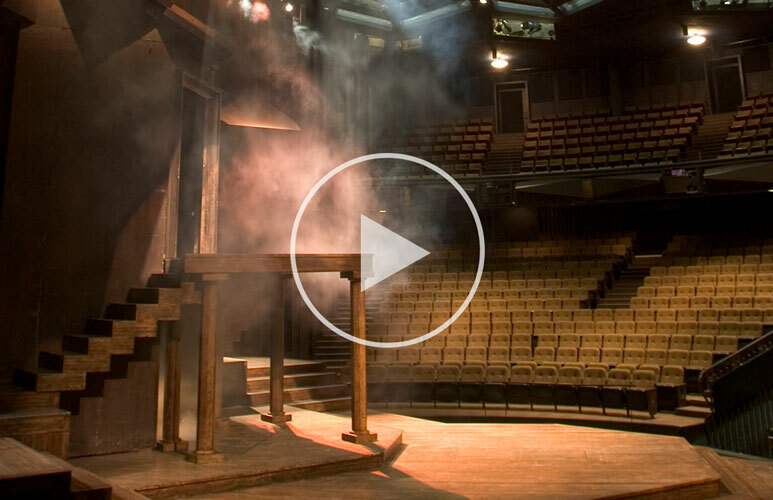 The heart of any theatre is its stage, and nowhere is this truer than here in Stratford. This 1954 Oscar-nominated film follows the founding of the Festival: how the idea grew, how a famous British director, international stars and Canadian talent were recruited, and how the Festival finally became a triumphant reality.